The areas surrounding Vanhankaupunginlahti feature a diverse range of different habitats. The shores of the bay include spruce-dominated old forests reminiscent of fairy tale woodlands as well as lush herb-rich forests, where you can easily lose yourself under the shadows of tall broad-leaved trees. The rocky meadows, on the other hand, are perfect places for examining plants that thrive in direct sunlight. The area’s most characteristic habitats are of course the extensive reed beds, which drown out the sounds of the city and form breath-taking open landscapes, especially when viewed from the bird watching towers. In the mid-19th century, the waters of Vanhankaupunginlahti covered a much larger area than they do today. In Säynäslähti, the water reached close to Viikki Manor, which was already standing in its current location at the time. Back then the field now located between the manor and the sea was largely underwater. Even today, the fields are sometimes flooded by the sea during particularly high tides, despite the drainage. The area’s extensive reed beds were most likely formed during the last two or three hundred years. The most prevalent habitats of the open wetland area are the flood plain reed beds, dominated by tall common reeds. 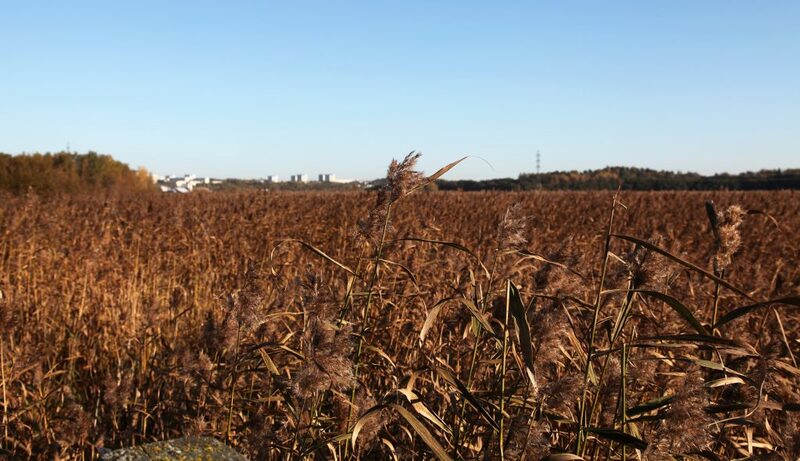 Although the reed beds may all look the same, researchers categorise them into ten different types, distinguished by water depth, the length of the reeds and the amounts of other plants growing among the reeds, for example. The driest areas, in many of which thick reeds have been growing since the mid-19th century, are located between Pornaistenniemi and Lammassaari, as well as the Purolahti grazing meadow. In these areas the reed beds can be traversed by foot without fear of wetting your shoes, at least during low tides, and other plants can also thrive among the reeds. These areas are the driest, type I–II reed beds. The central parts of Säynäslahti, in which the density of the reeds varied in the mid-19th century, are nowadays wet and at least partially waterlogged type IV and V reed beds. The isthmus of Loppi and the middle part of Saunalahti have begun to close off only in the last hundred years or so. Here the reed beds are muddy, waterlogged type VI reed beds. Other types of reed beds include the cattails that form in the corners of closed off ponds, for example. Have a look at the Viikki Latokartano map to see what the northern parts of Vanhankaupunginlahti looked like in 1846. The map is divided into several parts, which you can navigate between by using the numerical menu located in the upper right-hand corner of the screen. Source: The National Board of Land Survey, the National Board of Land Survey’s reform archive, City of Helsinki B7 Helsinki: 33 / 13–18 Viikin latokartano / Viks ladugård; Inventory map and explanation (1846). The growth of the reed beds can also be followed via aerial photographs in the kartta.hel.fi service. From the left-hand menu, choose All maps and materials -> Aerial photographs and then check the year you wish to view, such as the oldest available map from 1932 or the most recent. The maps are updated almost yearly. Some of the area’s most valuable wetland habitats are the low-growing coastal meadows, which can be found in the pastures surrounding Ruohokari. The flora of these meadows consists of low-growing sedges, grasses and rushes, which can be difficult to distinguish between with an untrained eye. The meadows have been expanded as a result of their use as pastures; as the cattle trample the ground and feed on the reeds and other tall grasses, they create better growing conditions for smaller plant species. Low-growing coastal meadows are extremely endangered habitats in Southern Finland, due to overgrowth caused by eutrophication and reduced grazing. The wetlands also include tall-growing coastal meadows on the shores of Pornaistenniemi, Mölylä and Fastholma, which are bordered by forests. These meadows stand out in the landscape due to the dominance of meadowsweet. The best meadows typically support many different plant species, but the quality of the meadows of Vanhankaupunginlahti is relatively poor. Tall-growing meadows are also extremely endangered habitats in Southern Finland. The sloped meadow of the Bäcks croft is located on tall rocks under a power line, to the north of Mölylä forest. The crevices of the open rocks are home to many notable plant species, such as the silver-furred, soft mountain everlasting, the aniline red maiden pink and the sporadically occurring fern moonwort. The rocky meadow has served to preserve these plants, as the thin layer of soil on top of the rocks is unsuitable for taller plants that dominate lusher areas. The Bäcks croft meadow is among the finest meadows in Helsinki, and one of the few low-herb mesic meadows in Finland, which are extremely endangered throughout the country. Vanhankaupunginlahti includes majestic spruce-dominated forests in Kivinokka and Mölylä. These forests are classified as natural old forests under the Natura 2000 classification, as they are very similar to forests that have developed naturally, without human intervention. Natural old forests are characterised by great variation in tree length and species composition. Seeds are allowed to germinate where they naturally land, so the trees do not grow evenly. Old trees are not cleared away. In Vanhankaupunginlahti, only dangerous trees are felled, and even then they are left to decay on the ground near where they used to grow. Due to different environmental conditions, natural old forests develop differently in different locations. 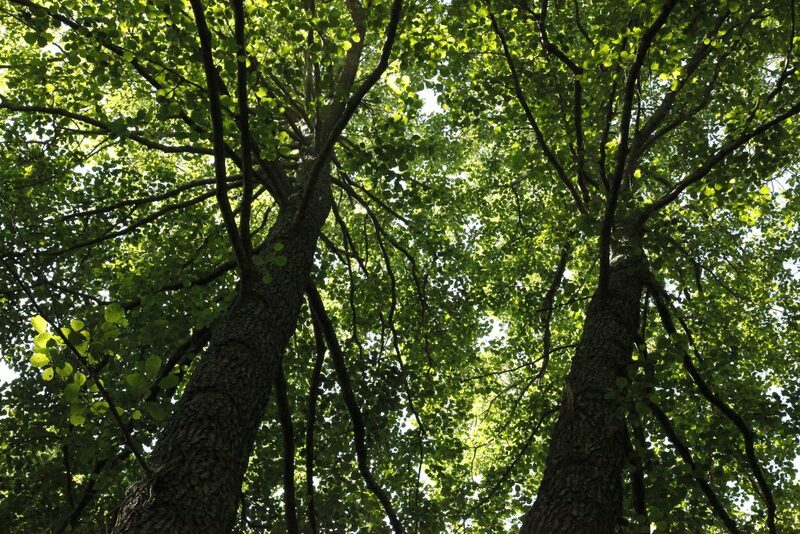 The species composition of the forests also varies during the different stages of their development. The forests of Kivinokka and Mölylä currently have large numbers of old spruce trees. When they eventually fall, they create gaps exposed to sunlight, which are quickly taken over by the saplings of broad-leaved trees. This process will result in an increase in the numbers of broad-leaved trees over the coming decades. Natural old spruce forests are considered by many to have a certain fairy tale-like quality to them, which is what draws people to Kivinokka in particular. The central parts of Mölylä forest also include some nearly untouched areas without any paths, which many animals, such as roe deer, use to get away from the clamour of the city. The low-lying coasts in the area between Mölylä and Fastholma, as well as in Säynäslahti, include deciduous swamp woods, which are frequently flooded, especially during high tides during the spring and autumn. In these kinds of wet conditions, dead plant matter decomposes slowly, and the floors of at least parts of deciduous swamp woods are covered in a layer of peat. Many broad-leaved trees thrive even in wet conditions, as a result of which the deciduous swamp woods of Vanhankaupunginlahti are characterised by an abundance of common alders and birches. Growing in wet conditions accelerates a tree’s life cycle, due to which there is usually plenty of decaying wood in flooding forests. In uneven woodlands, the water level often fluctuates. 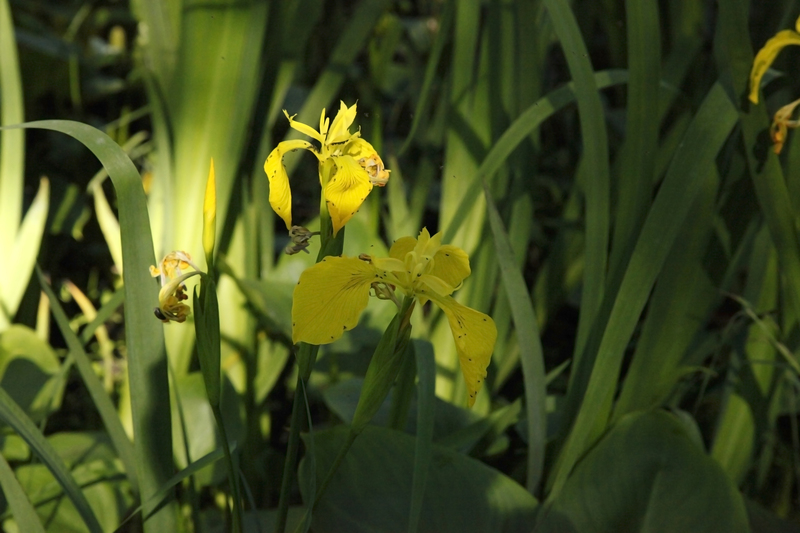 Wet flarks may spend the entire summer submerged in water, providing excellent habitats for impressive yellow irises, which bloom in the summer. Some of the driest areas found in these forest are the tussocks that form on the bases of trees and their various mosses. The field layers of deciduous swamp woods are also ideal for various grasses and sedges. The coastal areas and the borders of the spruce-dominated forests of Vanhankaupunginlahti are also dotted by a number of small herb-rich forests. Herb-rich forests can be identified from the fact that the forest floor consists of mull. Being rich in nutrients, mull supports the growth of more demanding plants. As a result, herb-rich forests are often filled with impressive broad-leaved trees and thickets of bird cherry. One particularly impressive herb-rich forest, especially in regard to its trees, is located in Pornaistenniemi, in the northern part of Vanhankaupunginlahti. As is the case in other areas surrounding the bay as well, in Pornaistenniemi, the trees have long been allowed to grow naturally. The area features many different species of trees, with the maples, aspen and goat willows, as well as the common alders in coastal areas, forming an impressive, high canopy. Underneath the trees, herb-rich forests are typically shrouded in shadows, supporting only a handful of field layer plants, such as the red campion, which is typically found in coastal herb-rich forests, or the common wood sorrell, which thrives even in low-light conditions. However, the ground is exposed to plenty of sunlight in the spring before the trees start sprouting leaves, which is why wood anemones and hepaticas bloom during this period. You can also find marsh marigolds, which usually flower in the early summer, along the duckboards even in late autumn in areas where the reeds have been cleared away. Since the forests of Vanhankaupunginlahti contain plenty of old and decaying wood, they are also home to large numbers of polypores, corticioid fungi and tooth fungi. These rot fungi are covered in greater detail in their own dedicated section.